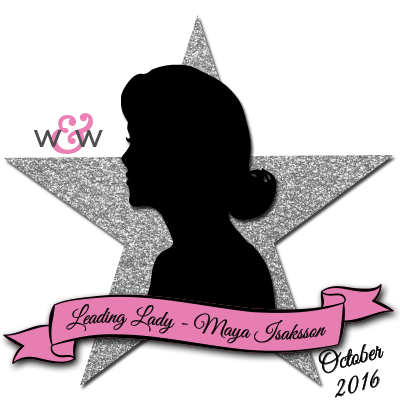 I am super excited to have been invited to be Leading Lady for October at the Winnie & Walter blog. I discovered Winnie & Walter right around when they started and has been following the blog and loving the stamps ever since. I was ridiculously happy when Shay asked me to be Leading Lady and waited (not very) patiently for October. The former Leading Ladies have been such an inspiration to me, as well as the Talent. I hope you will visit the blog to see the rest of my creations and also look at all the other posts there. AND as if that isn't enough, it's World Card Making Day and they always have the best inspiration over there. So let's get on to the fun stuff. The projects. I instantly thought of the idea to do negative coloring. I wanted to try to mask the stamped images and color only the background. I used a few different kinds of coloring and it turned out really fun! I really love to make backgrounds and this technique is perfect for playing with colors. For my first card I did a fall theme. I love the leaves in In Bloom: Renee's Leaves and they look perfect in all colors. The sentiment is from Happiest of Holidays with Evelin T Designs. The Essentials: Audrey Cutaways is a perfect set of dies, I reach for it all the time, I used it to cut out the tags for the sentiment. 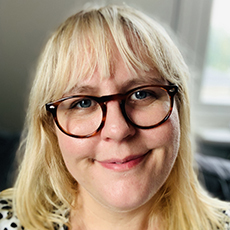 If I were you I would hop on over to the Winnie & Walter blog for two more projecs, more information on how I made them and last but not least all the fun inspirational WCMD events. Winnie & Walter has been super generous and given me a $30 gift certificate for their shop to give away to one of you (a coupon code which does not include shipping & handling), so in the end of the month after all my five posts are up I will give it to someone who has commented on one of my Winnie & Walter posts during the month. My last post is on October 29 and I will draw a winner one week after that on Nov 5th. I will select a comment from one of the five Leading Lady posts here in the blog. So that's it from me for this first week. I can't wait to show you what I made for next week. See you then! Congrats on your Leading Lady role, Maya. Love your bright and beautiful creations today. Congrats on your Leading Lady spot! Love your gorgeous cards featured today, and looking forward to seeing more! Love the effect of the white images against the beautifully colored background. Well done. lovely cards! congrats on being leading lady! WOW how gorgeous. You've inspired me to go get some masking fluid. This looks gorgeous. 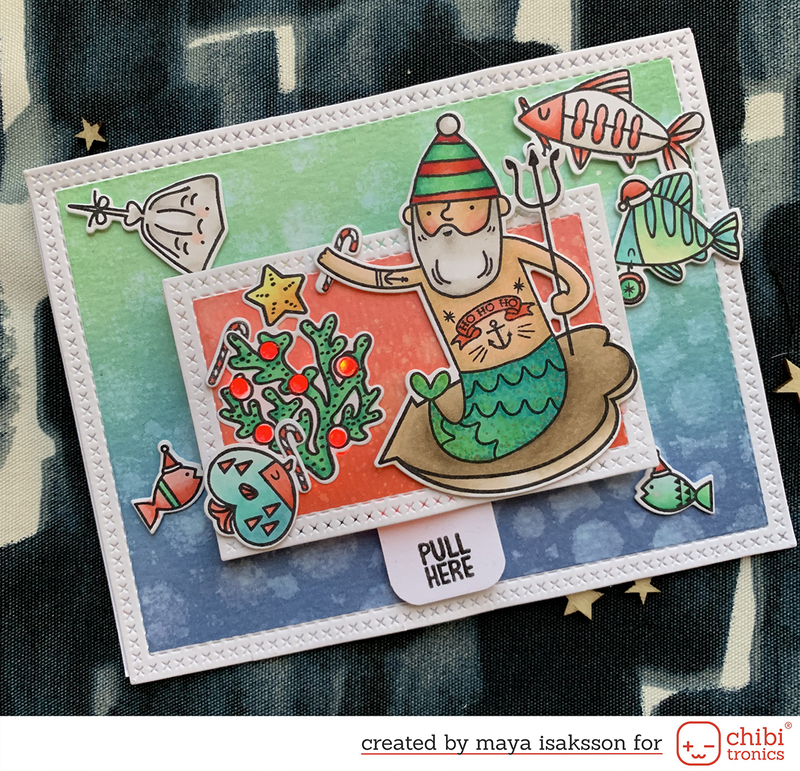 The backgrounds on your cards were stunning and really showcase the stamps! What a clever idea! I'll have to try it sometime! Love all three of your cards! Beautiful watercolouring! Congrats on being chosen as a leading lady. Love these cards you created. Gorgeous masking on those cards! Well done! WOW! Certainly easy to see why you're a Leading Lady: creativity in abundance revealed here! Your negative colouring: gorgeous! Living in Canada, and surrounded by the fall colours (actually, it's snowing lightly here today....yikes! ), I'm quite captivated by your first card. The leaves and autumn palette are stunning! Adding this technique to my 'must try' list. Excited to see what you'll dazzle us with tomorrow! Love the background you have created..the leaves are the star!! Maya your creations are wonderful! So glad to be introduced to you!!! Love the layout and the fabulous background. Oh I love these leaves! So pretty. Pinning it! Congrats on your Leading Lady spot! Your card is amazing!!! Beautiful card. I like the technique and the fall colors. 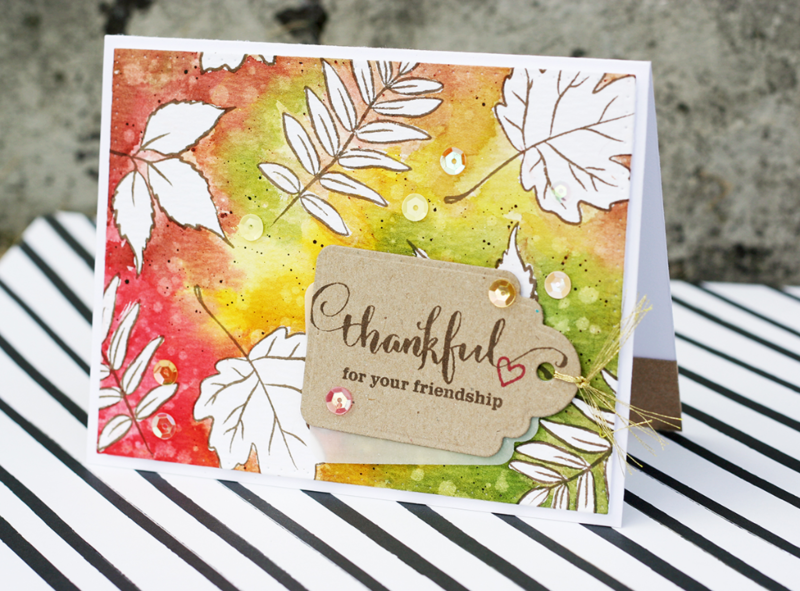 The gorgeous foliage you've used really captures the feeling of this Autumn season. You showcase the stamps SO beautifully. Have a blessed week! Your watercoloring technique is brilliant. Lovely projects. The colors are welcoming and joyful. Love the water droplet technique to lift color from the backgrounds. Autumn, leaves and watercolor, oh mine, it does not get any better. Cheers!